1 x dark grey panel and 39 x black styrene bezel parts, 26 clear styrene instrument face and bulb parts, 2 x pre-coloured PE fret of instrument placards & needles and 1 x self-adhesive vinyl sheet of instrument faces. 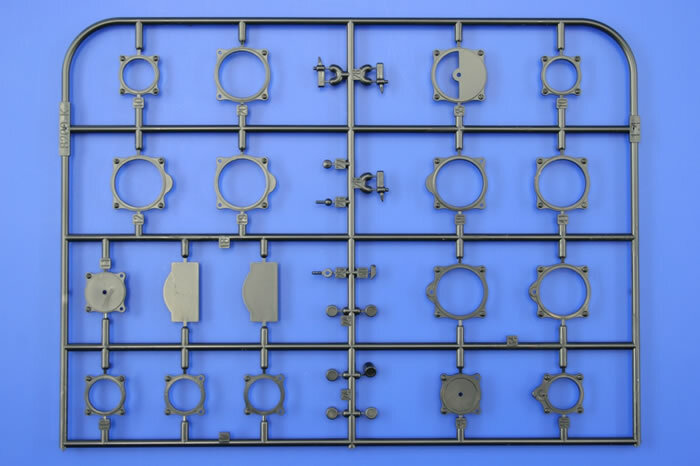 Great idea for an interesting display item, high quality production of components. A great project for a change of pace from your regular modelling projects. 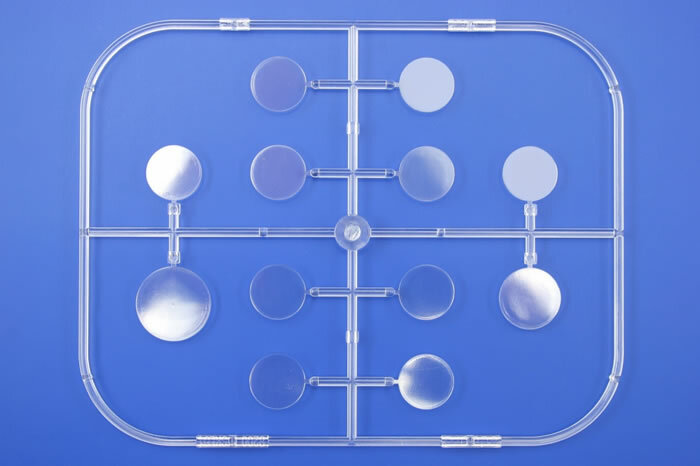 This is a top quality package that should result in a very attractive display piece. Despite struggling in the battle of Britain to live up to the Luftwaffe’s expectations as long-legged heavily armed destroyer when confronted with modern single-engined fighters, the BF 110 never the less provided long and useful service throughout WW2. It proved a useful workhorse and came closest to fulfilling its destroyer function when confronting unescorted day USAAF day bombers, as well as combating the RAF in the night-fighter role. I have always liked the Bf 110, especially the early versions, regarding it as one of the more elegant and aesthetically pleasing of German designs. 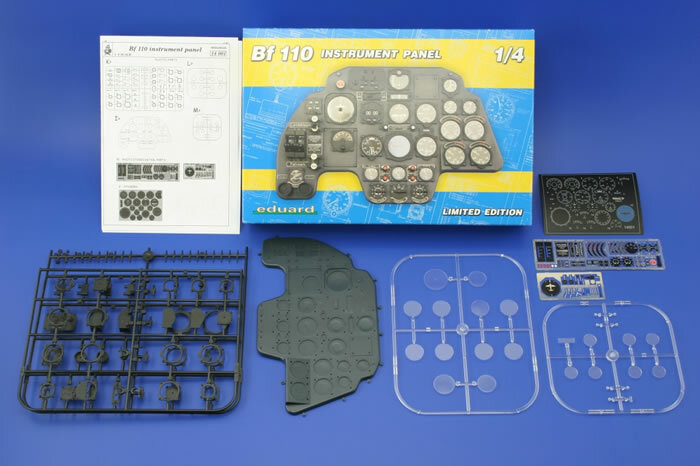 So it was some interest that I examined the contents of Eduard’s 1:4 scale instrument panel for a Bf 110C. 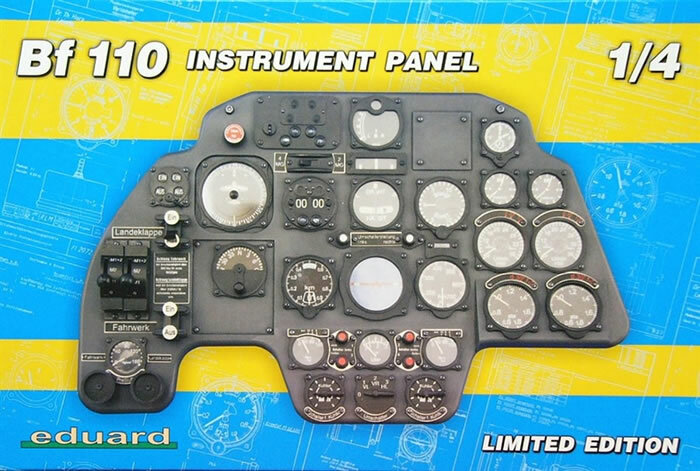 This is a reissue as the instrument panel was previously a bonus extra in Eduard’s Bf 110 C/D/E Royal Class twin kit boxing of the Bf 110 (Click here to see Brett Green’s review article) .The kit comes in a good quality top-opening box with an image of the completed instrument panel. Inside the various styrene parts are sealed in cellophane, and the pre-coloured PE fret and self-adhesive instruments come in zip-lock plastic bags. 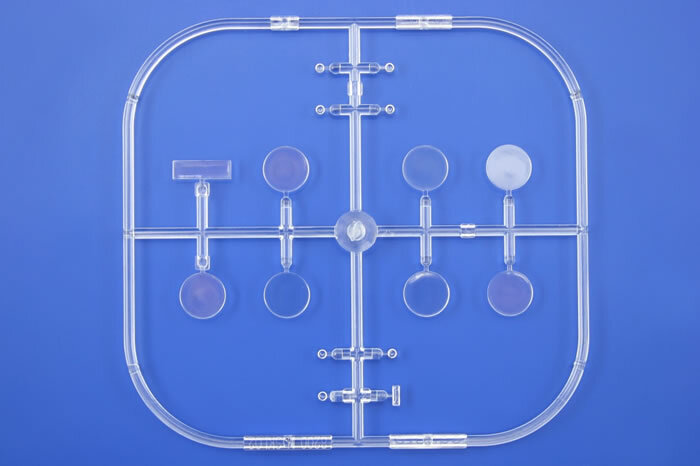 Clear and self-evident instructions include a parts map and diagrammatic assembly steps. Other instructional requirements are provided using symbols tied to a key in English, French, German and Czech. The quality of the parts is excellent across all media. 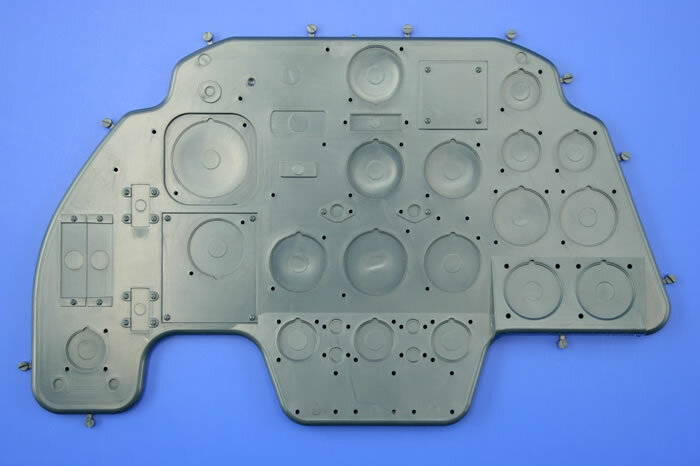 The panel itself, instrument bezels, screw heads and switch bodies are moulded in black styrene; whilst clear styrene is provided for the instrument glass. A self adhesive vinyl sheet has very clearly printed instrument faces, and the coloured PE fret caters for various placards and some instrument needles etc. 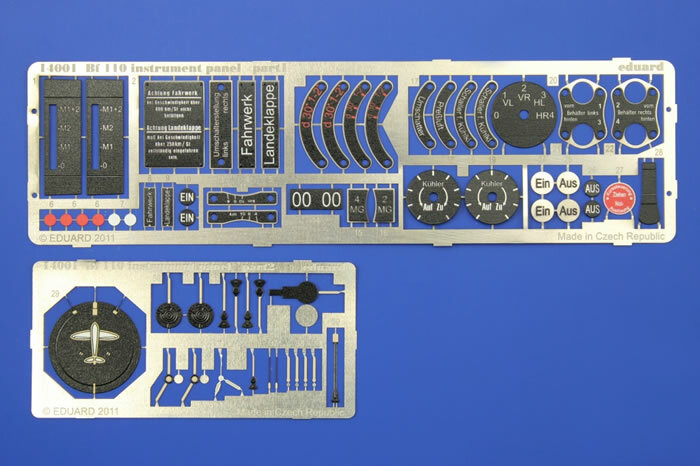 Assembly looks to be very straightforward, but obviously care following the instructions will be needed to make sure all the dials and placards are in the right places (the vinyl instrument faces have a tab to align with a notch within the bezel to help with this). There are also some small and fiddly parts despite the kit’s very large scale, so again care and patience will pay off. In fact it’s really a case care rather than high skill levels being all that’s needed to achieve a very high quality of finished product here. This is an excellent quality package produced the high standards we have come to expect of Eduard. The concept is an interesting one, and I should think that it has the potential to appeal to a range of modellers. 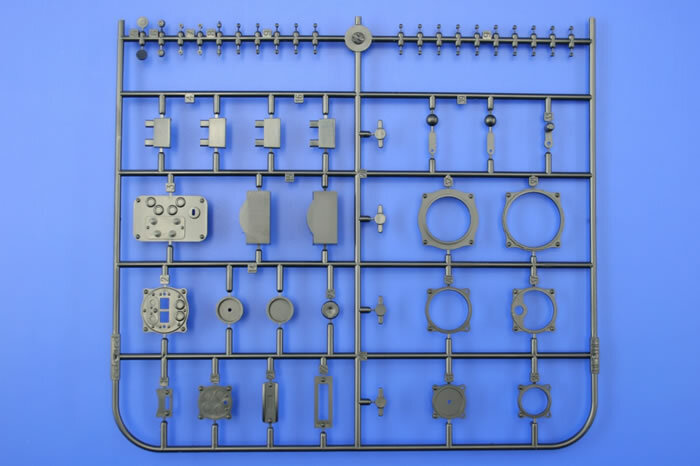 The kit will demand care more than skill to achieve a high quality finish. It could be just the tonic for modeller’s block or a relaxation after a demanding project. The finished result will certainly look good as in any model room, den or display location. I can’t help but think that this type of kit would sell best if part of a series or collection. 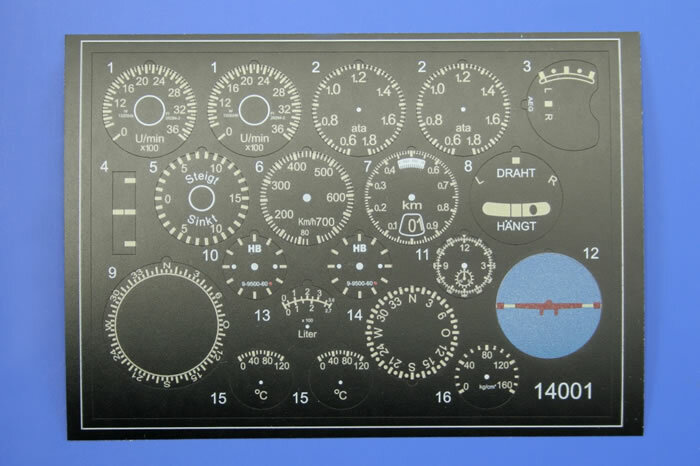 I’m sure, despite my fondness for the Bf 110, that there are other more popular subjects that Eduard could issue instrument panel kits of to the same scale. It should be no surprise that I thoroughly recommend this kit.